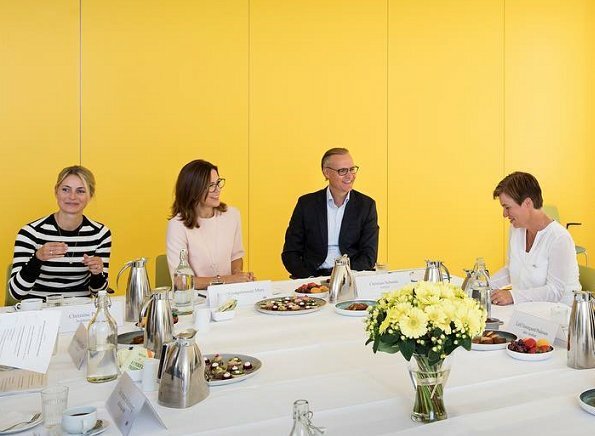 On August 22, 2017, Crown Princess Mary of Denmark made a work visit to The Danish Cancer Foundation (Danish; Kraeftens Bekaempelse) in order to receive information about the works of the Foundation and ongoing and future activities and events. She looks great in her glasses! Lovely! Pretty outfit and Princess Mary looks lovely in her glasses. I wonder if she wears her glasses only for fashion. She looks very cute with the glasses!